Five minutes makes a huge difference. 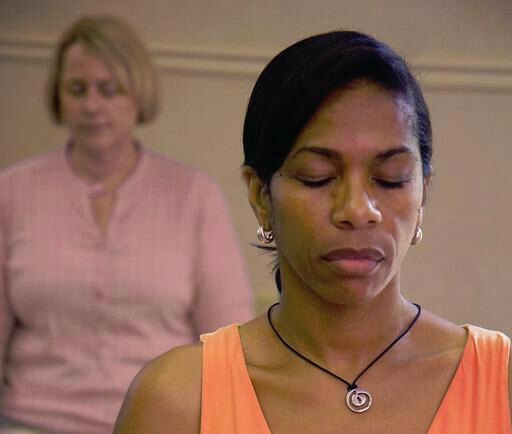 Learn to find inner peace in a five minute meditation. Not only will you feel better, so will the dear ones you are caring for. It’s amazing how such a simple thing can help so profoundly. It all happens when you learn from a master. Only a meditation master can really make meditation easy and accessible. Swami Nirmalananda shows you the way inward, to discover the source of peace within you, the inner source from which joy and love arise. Join us for a sweet and simple workshop, focused on your needs. Our workshop presenters have experience in supporting caregivers like you, showing you how to take care of yourself while taking care of others. Learn some easy moving-and-breathing practices for instant centering. Learn a short meditation, plus how to settle deeper into your center by staying a few minutes longer. Most importantly, you experience the calm centered place within, the still point that supports you in the midst of the tornado of life. Shelley Zeichner, Health & Wellness Event Planner — after many years of planning and designing all types of special events, stress led Shelley to seek techniques for peace of mind. Finding meditation was life changing and career changing. 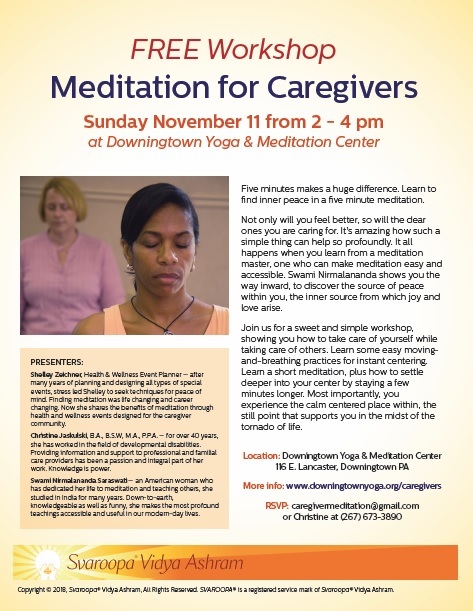 Now she shares the benefits of meditation through health and wellness events designed for the caregiver community. Christine Jaskulski, B.A., B.S.W, M.A., P.P.A. — for over 40 years, she has worked in the field of developmental disabilities. Providing information and support to professional and familial care providers has been a passion and integral part of her work. Knowledge is power. Swami Nirmalananda Saraswati — an American woman who has dedicated her life to meditation and teaching others, she studied in India for many years. Down-to-earth, knowledgeable as well as funny, she makes the most profound teachings accessible and useful in our modern-day lives. Calm, centered and strong, drawing from the source of peace within. I meditate.